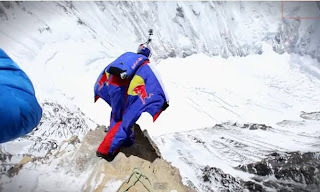 Russian Valery Rozov, 48, jumped from the north face of Everest at a height of 7220m above sea level. The summit is much higher at 8,848 meters. But this was very high and the higher you go the thinner the air is. So I give him credit for a major accomplishment. Yahoo NZ shows video of the climb from base camp and the jump. ITV News has a video of the jump only taken from several angle including the back of his helmet. Photo from Yahoo NZ. He starts by jumping off a very, very high cliff. Click to enlarge.